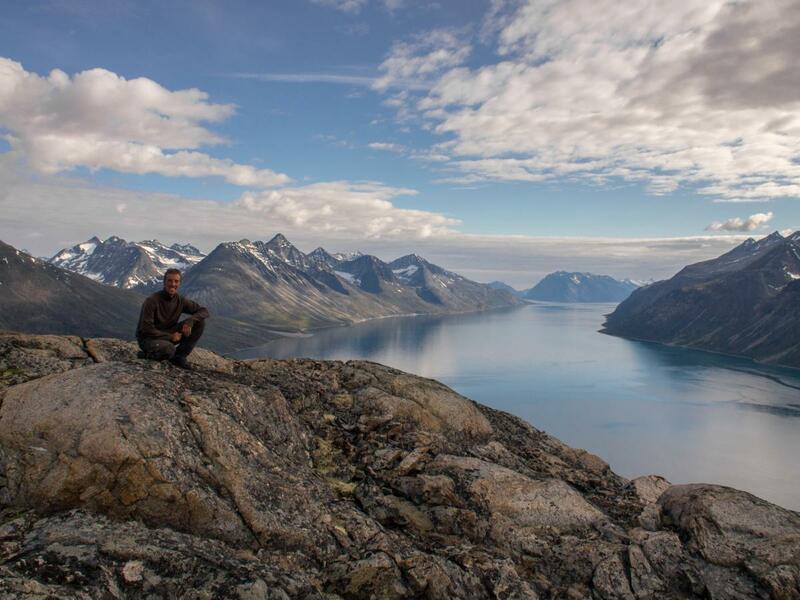 When I paddle away from the sheep farms at the head of the Amitsuarssuk fjord, I start the most precarious part of my trip: a 40km run across the Itivdleq pass, through the Isortup qôrua valley, across wild and nameless mountains and passes, and back down the extremely remote Kûgssuatsiaq valley towards the Søndre Sermilik fjord, followed by a crossing of the fjord itself by packraft. 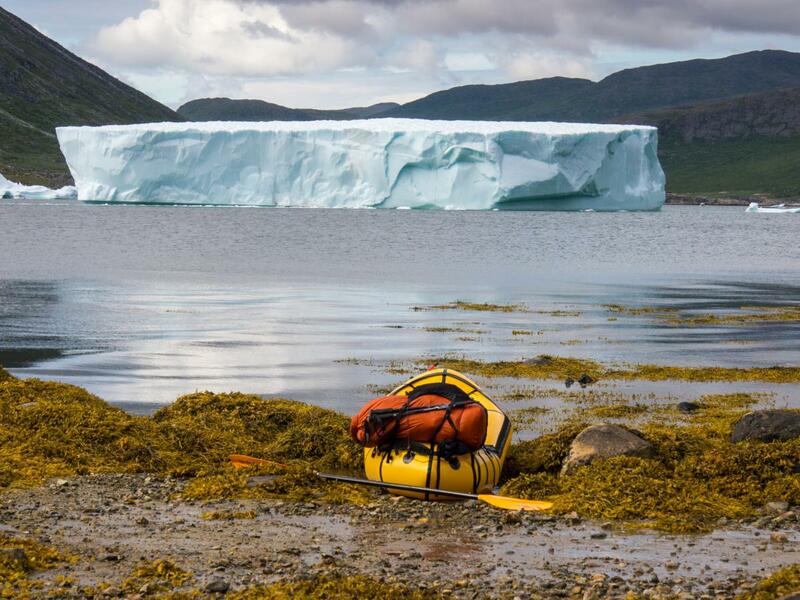 Fighting against a good headwind, I keep the massive iceberg well to the right of my raft and paddle on towards a seaweed-covered beach just west of the Itivdleq pass. It is already late in the afternoon, but I decide to push on towards the pass (220m) in order to be able to penetrate as far as possible into the Isortup qôrua valley tomorrow, and get across the mountains in one go the next day if weather conditions allow. It is a though and slow bushwhack through 2-3m high brush again on some stretches, but as I approach the pass the terrain gradually becomes easier. After just under an hour I reach a small pond and decide to pitch my tarp. It is a warm and sunny evening. After dinner I go for a walk on the southern slopes of Nutdluartoq (1390m). 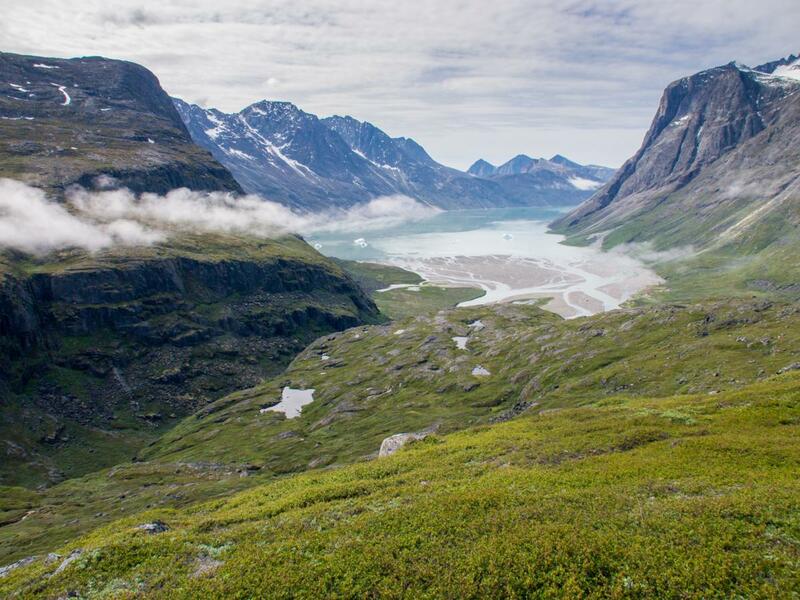 The frontal views towards the mighty, isolated Akuliaruserssuaq range, with peaks towering up to well over 1500m above the fjord and with small cirque glaciers hidden near the summit, become astounding. Deep below the shadow of the mountain eats the small ponds on the Itivdleq pass one by one. The massive iceberg still proudly guards the entrance to the head of the fjord. 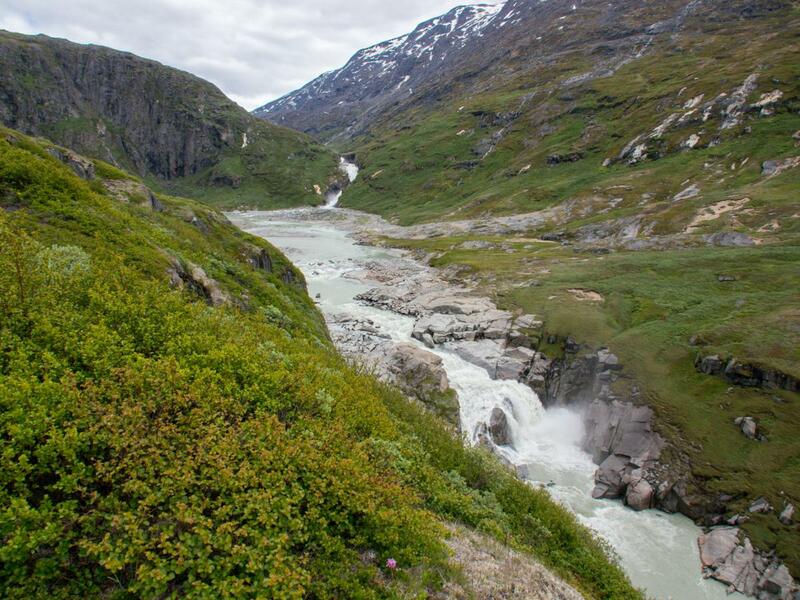 In the east, the braided Isortup kûa river, swirling with the massive discharge of meltwater from the glaciers at the upper end of the Isortup qôrua valley, vomits its sediment into the Sioralik fjord. Multiple stranded bergs await their decisive blow by the sun, while an impressive phalanx of jagged peaks pierce the sky at the far end of the fjord. 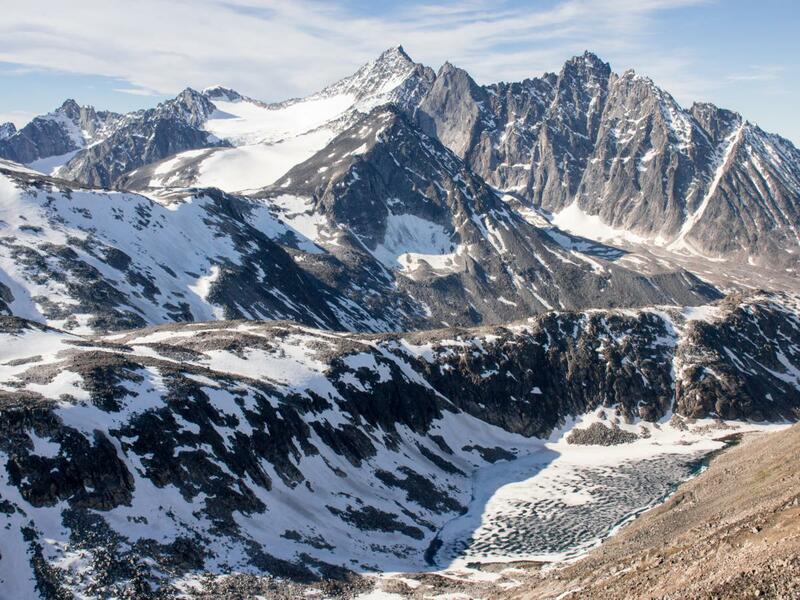 The mountains roar with meltwater. It is a bloodcurdling scenery, it is a bloodcurdling evening. I just sit and watch until the alpenglow floods the mountains. The following day brings more stable weather, with dissolving morning fog steaming above the fjords. I start traversing east into the Isortup qôrua valley at an altitude of about 250m, following sheep tracks as I find them – and losing them again as they faint in another long zone of knee-deep brush. Every 50 to 100m a deep, boulder-infested gully crosscuts the slope. My progress is slow. I try to gain altitude. From Google Earth I know a steep cliff face rising from the river to an altitude of about 300m blocks the entrance to the valley slightly upstream. I manage to find a good traverse path above the cliffs. Then I have to descend steeply towards the river again to pass below the next cliff face, with increasing amount of bushwhacking on the way. On the way a small creek comes down the slopes through a narrow but deep ravine, and I have to detour to find a place to cross. Finally I reach easier terrain when I make it to the river just downstream of a braided section at about 160m altitude, and decide to take a long break. I have covered 6km in three exhausting hours. A faint sheep track on a sandy levee along the river finally offers me some walking comfort along the braided river, but then another horrendous bushwhack follows as I climb up the next steep rock band towards the next braided section, with the river thundering down a series of powerful waterfalls to the right of me. At some places I have to use the strong willow branches to pull myself up the slopes. 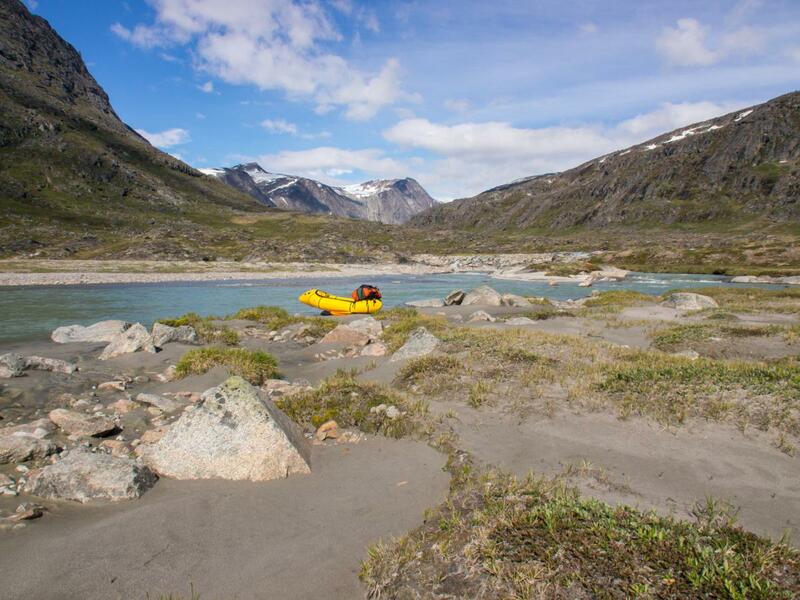 There is little time to enjoy the impressive views back through the valley and towards the Akuliaruserssuaq range. When I finally make it up the rock band, I carefully study the next braided part of the river, which is the confluence of two massive glacial rivers: the first one coming from the Sioragdlip qôrua valley, and the second, which I have to track upstream, from Isortup qôrua. To do so, I must get across the river coming from Sioragdlip qôrua. Wading is out of question. The only option is my packraft. I search for a safe spot to get across without risking to be sucked downstream into the deadly waterfalls. I pick a spot on a calm and wide section of the river, just downstream of a waterfall and with easy beaching at the opposite side. I easily make it across and beach my raft on the intended spot. I continue upstream for another hour through the opening valley. It is a highly enjoyable and easy stroll with splendid views. 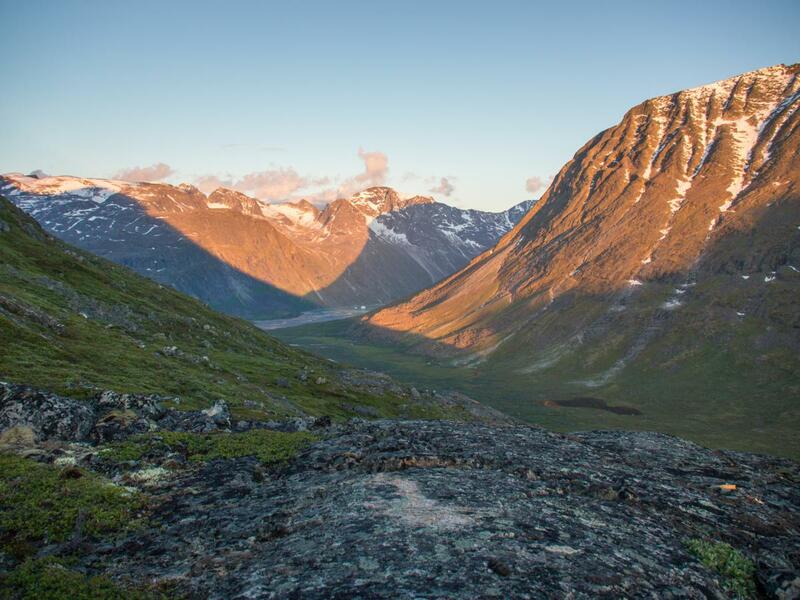 I start to study the southern valley slopes, which I have to climb frontally tomorrow to start my high crossing towards the fjord. The weather remains good – and I hope it will for another day as I can only attempt this route with good visibility. I go to bed early – and put my alarm clock on 4am. To my relief the weather remains nice the following morning. 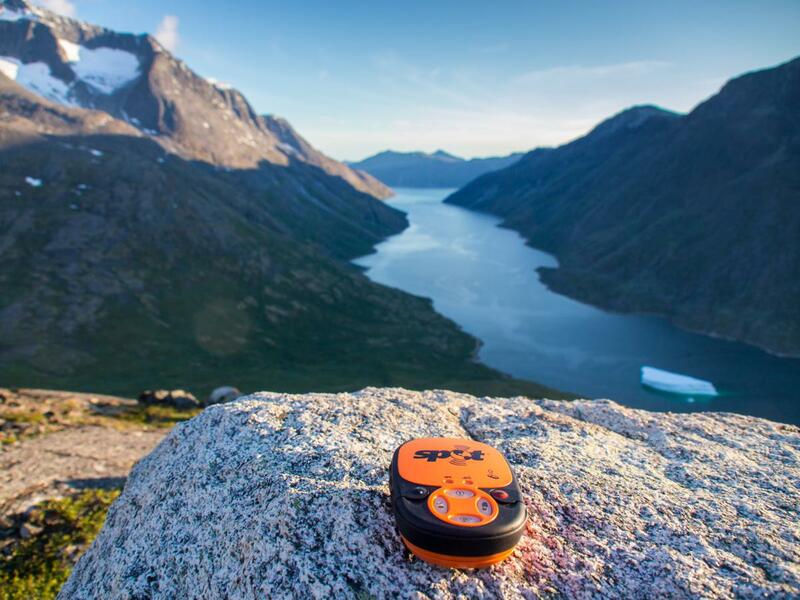 I explode into action immediately and hit the trail around 5am, not knowing whether or not I will find a safe route across the mountains and into the Kûgssuatsiaq valley. In a worst case scenario, I will have to hike back all the way towards the sheep farms. I start to climb the 30° valley slopes near a braided section which is erroneously indicated as a lake on my map. 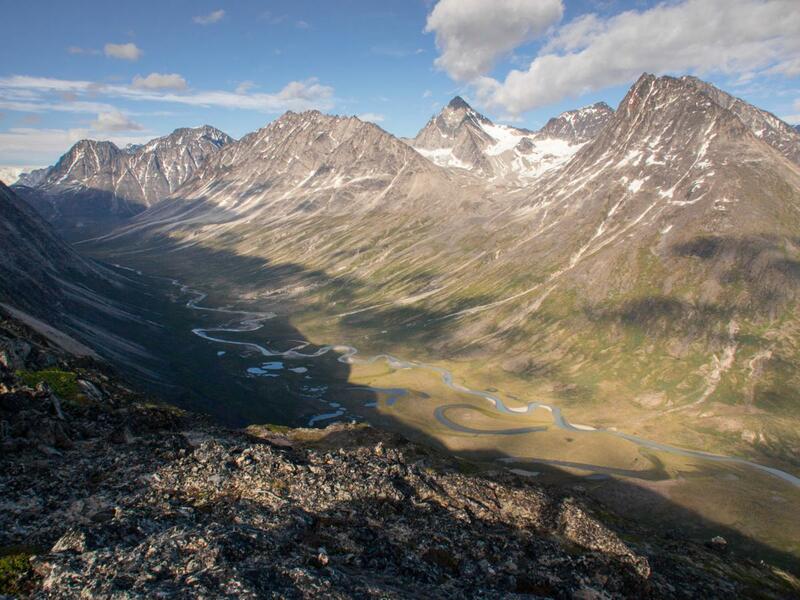 The terrain is an alternation of rocky tundra, rock slabs and boulders. On the way I encounter 2 arctic hares again, which shoot away at amazing speed again, then keep observing me while standing on their hinds. 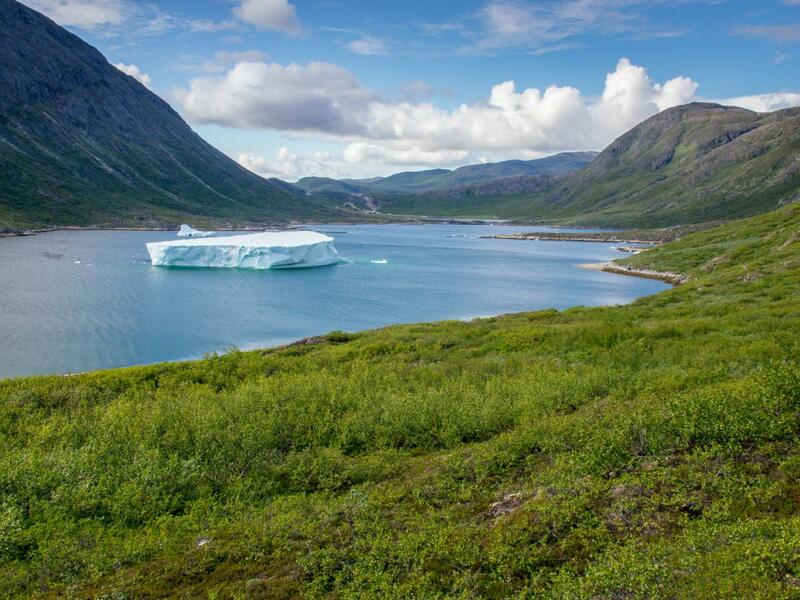 My progress is relatively fast, and at half past six I reach the ridge a few hectometers west of the place I had been aiming for – a lake still mostly covered by ice floes. After a break to eat and drink I climb a steeper slope just east of the lake, now regularly crossing snowfields on the way up. At an altitude of about 1000m the wide ridge starts to flatten out. I try to link large snowfields to avoid the boulders while gradually gaining altitude. Then at about 1150m the ridge becomes more narrow again and a phenomenal panaroma start to open up. I push on all the way to the summit of a nameless mountain (1230m), then take a long break to eat and drink and allow my body some rest. The views are terrifying and sensational at the same time. The mountain scenery from this forgotten summit must be the wildest I have seen in my entire life. 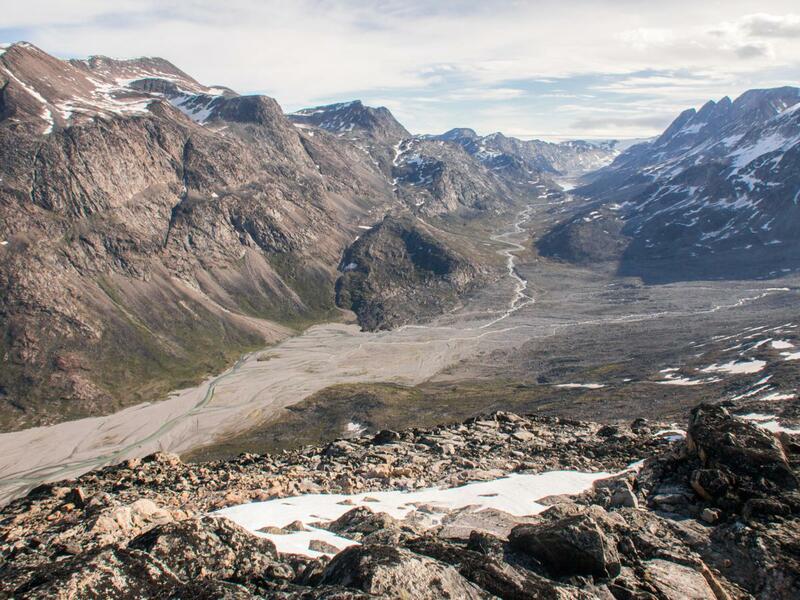 I can view through the Isortup Qôrua valley all the way up to the South Greenland Ice Sheet, which serenely rests on the flat summits in the northeast. The river snakes its way down the river through an alternation of wild, single-channel stretches with roaring waterfalls and long, brilliantly braided sections, while contouring the vast, light-grey scree fans streaming out of the gullies on the nearly vertical northern valley walls. 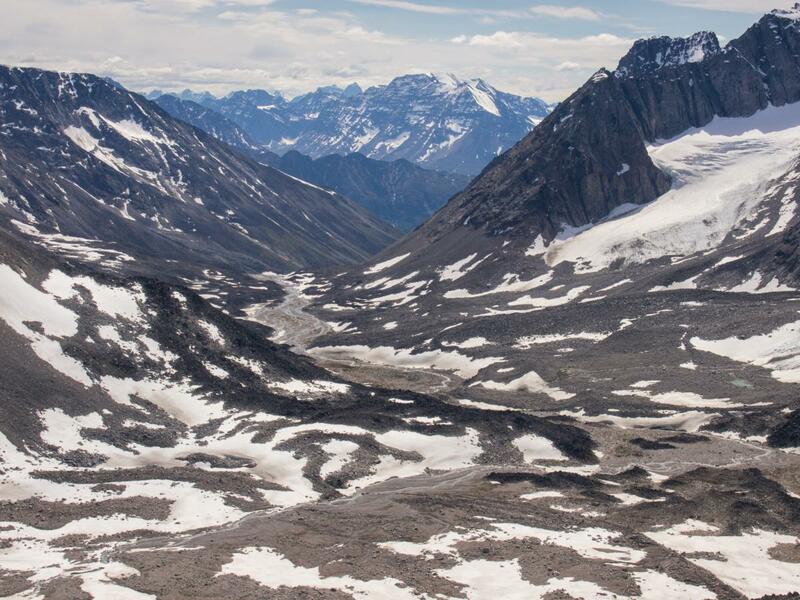 In the east a massive glacier with splendid middle moraines and ending in a desert of scree and boulders snakes down from numerous cirques high on the western slopes of another impressive, nameless mountain (2150m). 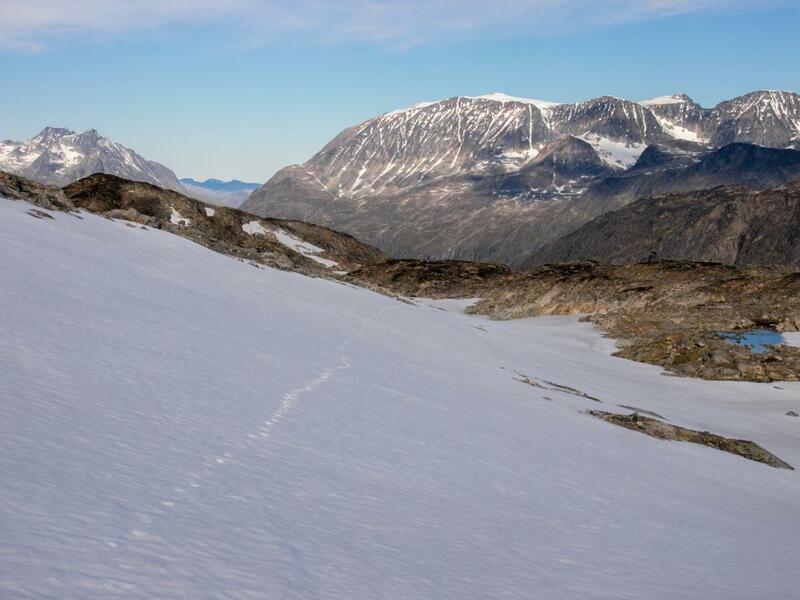 Then in the south I can trace the Hendrik Lundip qôrua valley all the way down from the frozen lakes bellow me to the Unartoq fjord, almost 20km away. But the most impressive, jagged peaks, rising almost 2000m above sea level and separated by ridges as sharp as razorblades and with countless steep granite spires, make up the horizon in the southeast. Exactly where I am going. 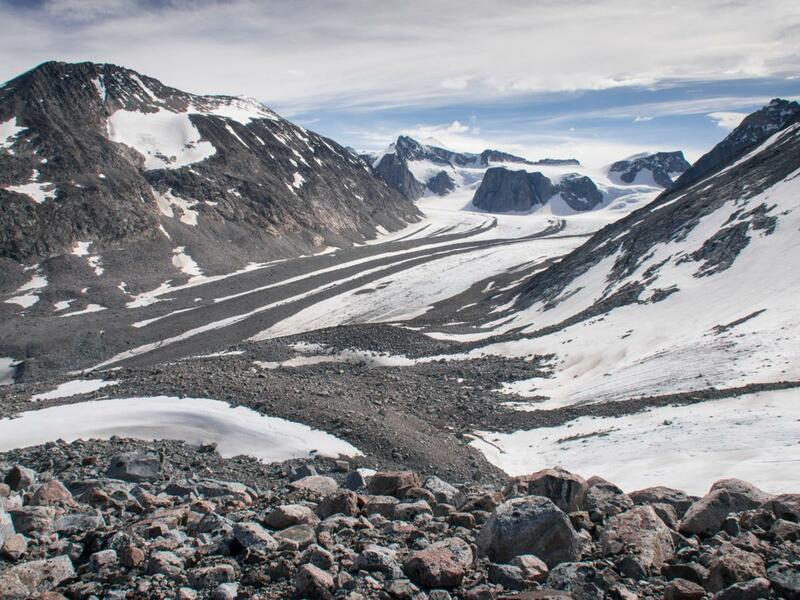 To make it to the pass separating the Hendrik Lundip qôrua and Kûgssuatsiaq valleys, I must first descend to a lake (870m), then climb up to a boulder-covered ridge (in fact nothing more than a huge lateral moraine of another nameless glacier), and track this ridge across a summit (1330m) and down to the pass (1140m). 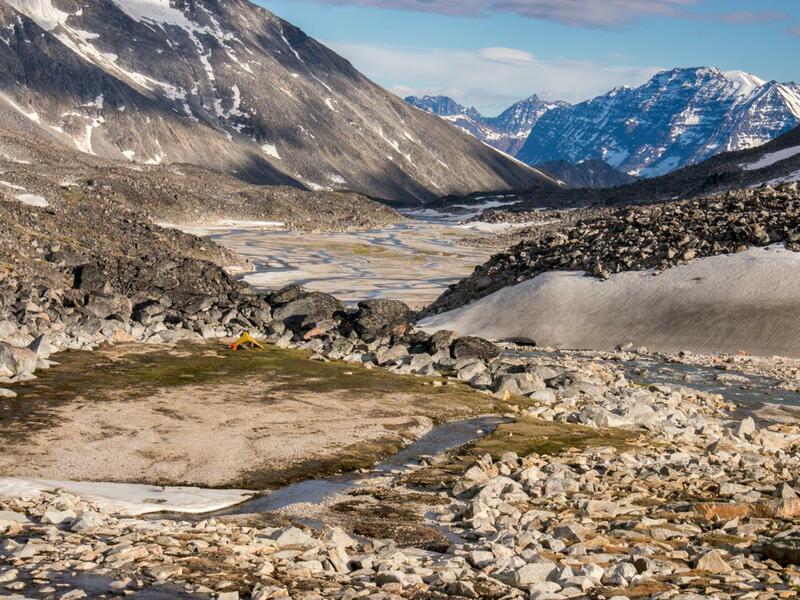 Then from the pass I have to descend steeply into the Kûgssuatsiaq valley, the bit I had most doubts about while planning the trip. By the way, from the summit I am standing on it looks easy to climb up to lake 870m directly from the Isortup Qôrua valley on a gentle slope of tundra and boulders, thus avoiding going across summit 1230m in case of doubtful conditions or if you want to make the stage shorter. I easily descend towards the lake on rocks and boulders and take another break before starting the hardest stretch of the day. At around 10am I start climbing towards the ridge, now exclusively on increasingly large boulders. The going is slow, but the real deal only starts when I make it up the ridge, now with phenomenal views towards the glacier with the middle moraines. 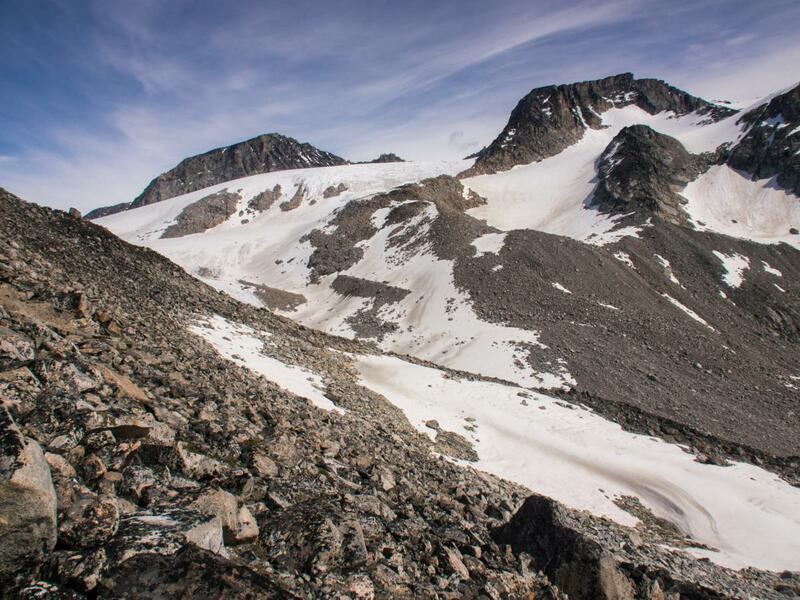 I continue climbing on the ridge (which is a lateral moraine of a glacier just below me to the left) through a real inferno of scree and loose boulders. 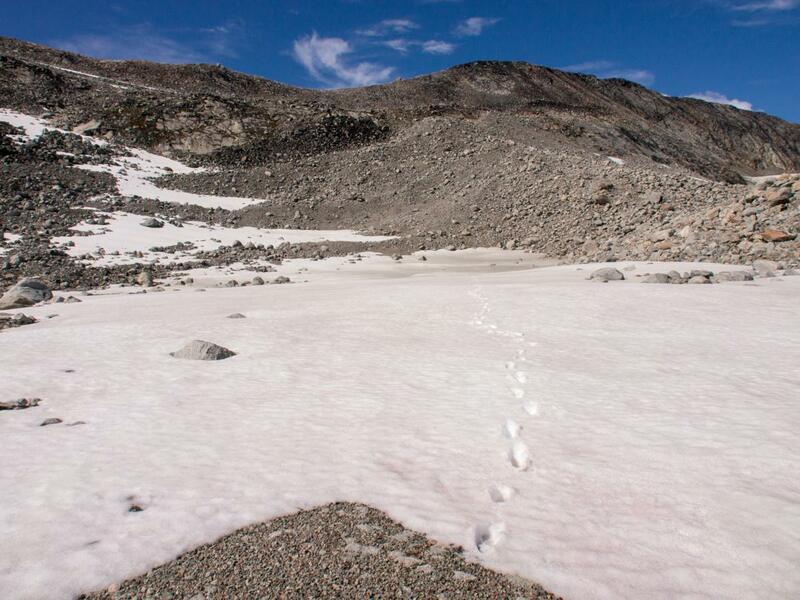 The scarce snowfields bring little relief as they are now very soft because of the warm and sunny weather. When giving it a try I sink in deep and even have to continue on hands and knees on the steeper bits. It is a harsh stretch and I consider myself lucky with the nice weather conditions. It is tempting to go onto the glacier, which looks devoid of crevasses, but I take no risks and accept my fate. Then finally as I approach the summit and climb higher above the glacier, the loose moraine trash makes way for an alternation of stable boulders and real bedrock, an things finally become easier. After nearly two hours from the lake I finally reach the summit of mountain 1330m. It is a bit before noon. 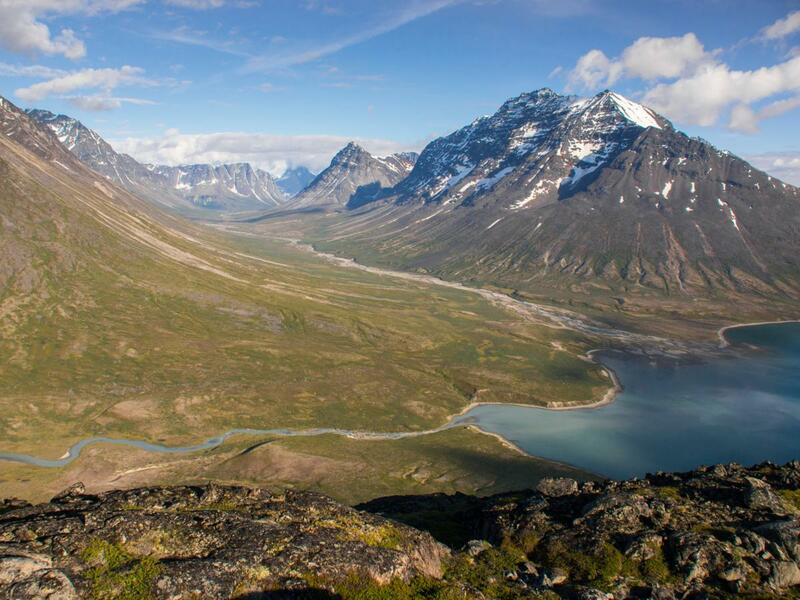 From the summit I can look into the Kûgssuatsiaq valley for the first time. 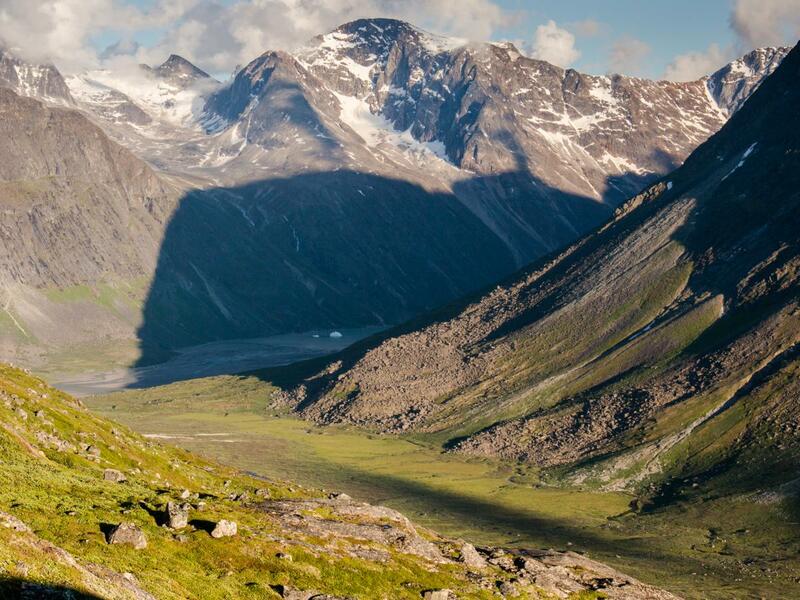 The view brings little hope of improving terrain: the entire upper half is a battlefield of snowfields, boulders and terminal moraines of the numerous glaciers flowing deep into the valley from the slopes of the jagged peaks lining it. I fail to see the tiniest dot of green. Deep down the water of Søndre Sermilik glisters in the sunlight for the first time, with the next chain of mountains directly behind. Further away I can just see the summit of mightly Ketil (2004m), still over 40km away along Tasermiut fjord, piercing the sky. I start descending the ridge until I find a spot where I looks possible to dive into the valley. Guess what, on boulders. The steepest bits are about 35°, but overall it’s a descent far easier than I had feared. Suddenly I reach a wonderful, miniscule patch of grass in the middle of this mineral wilderness. With all crucial passages now taken, I don’t hesitate a second and take a very long break in the warm afternoon sun, enjoying the feeling of accomplishment. After that, more boulders, more snowfields, more unstable moraines. I cross the quickly enlarging stream through the valley, fording it a couple of times to avoid the worst terrain. And then, just before descending towards a large alluvial plain, I reach the most stupendous of bivouac spots. 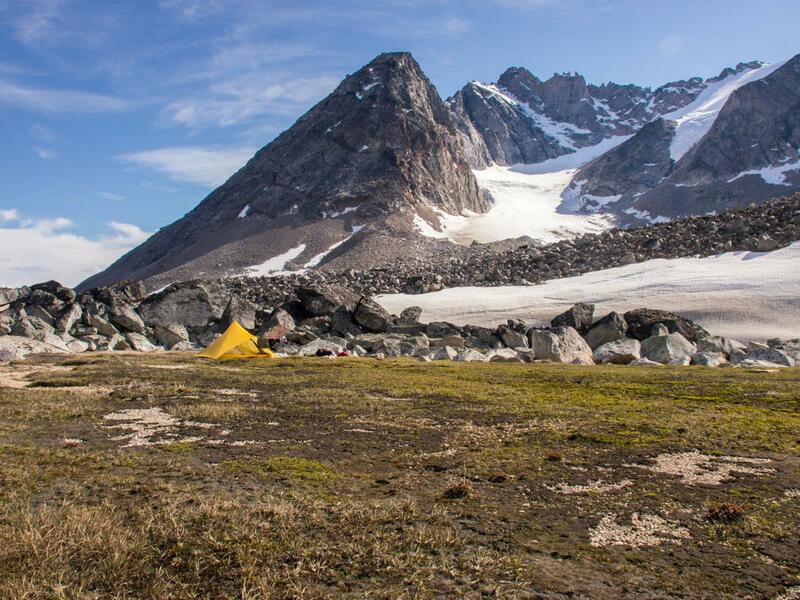 It is a miraculous, dead-flat, green and sandy plain in the middle of the most remote valley I have ever seen, sheltered by an arch of massive boulders which make up a tiny moraine. The soil is soft like butter, yet perfectly dry. 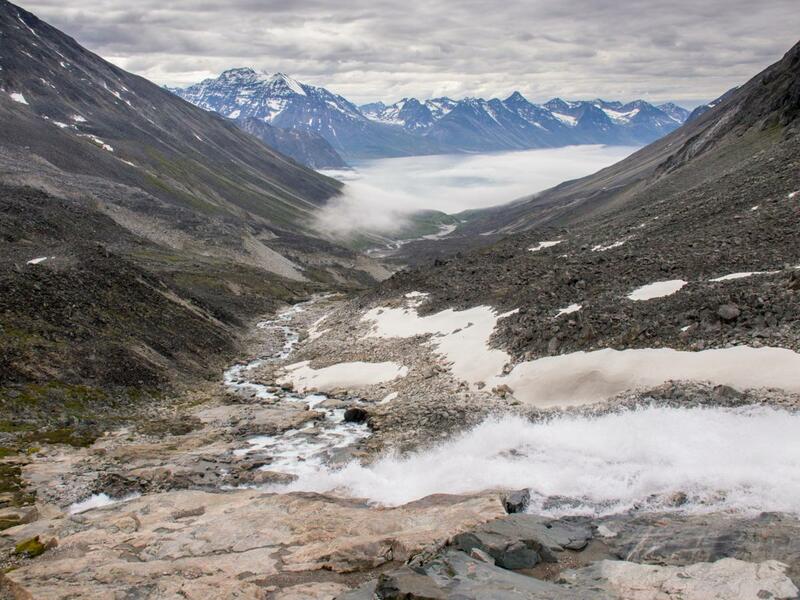 Meltwater streams roar in all directions, and I am surrounded by the wildest of mountains. I have just completed the most daring walk of my life. It is a perfect spot, it is a perfect evening, and I can’t help smiling until I go to bed. By the next morning it has finally become overcast. I leave my tiny paradise behind and hop from boulder to boulder towards the alluvial plain, which allows for some swift progress until I hit the next waterfall and associated boulders. 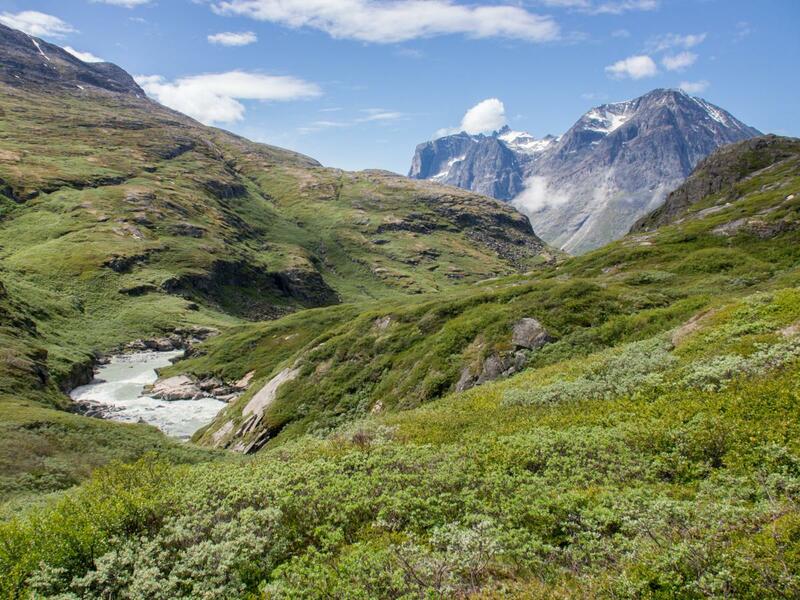 In fact, the terrain remains harsh all the way down to the fjord, mostly on boulders as I remain close to the creek which cuts deep trough enormous moraine ridges. Early in the afternoon I finally reach the debouchment of the river in the Søndre Sermilik. 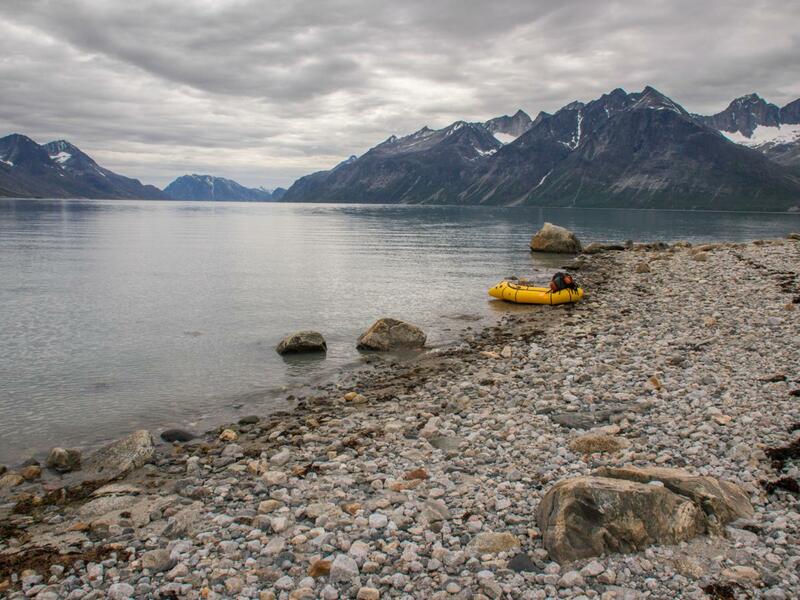 There is nearly no wind, so I start to inflate me raft immediately in order to cross the fjord as quickly as possible. It is an exposed 3km run towards the other side, followed by another 3km along the Alakarigsupqáqâ cliffs. In case of windy weather I could have been stuck at this uninviting spot for days. 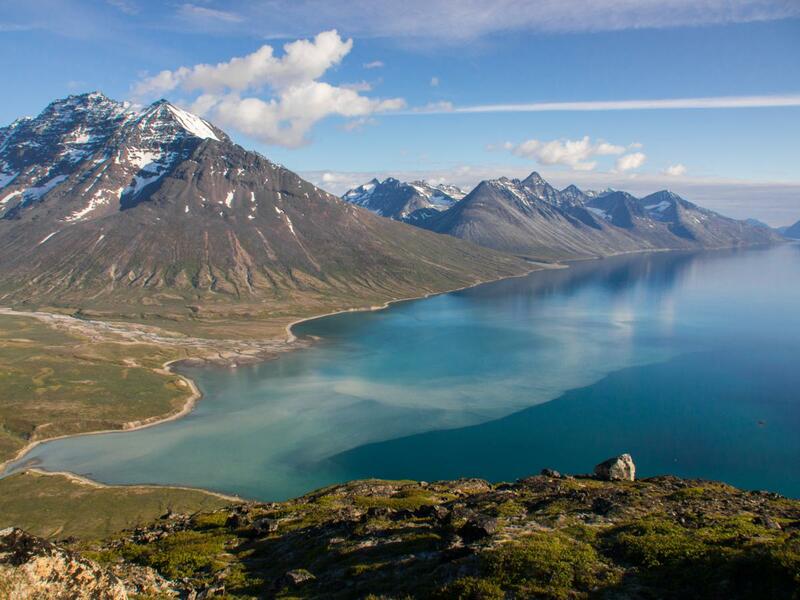 I cross the fjord in a straight line, and reach the relative safety of the eastern shore after about 40 minutes. 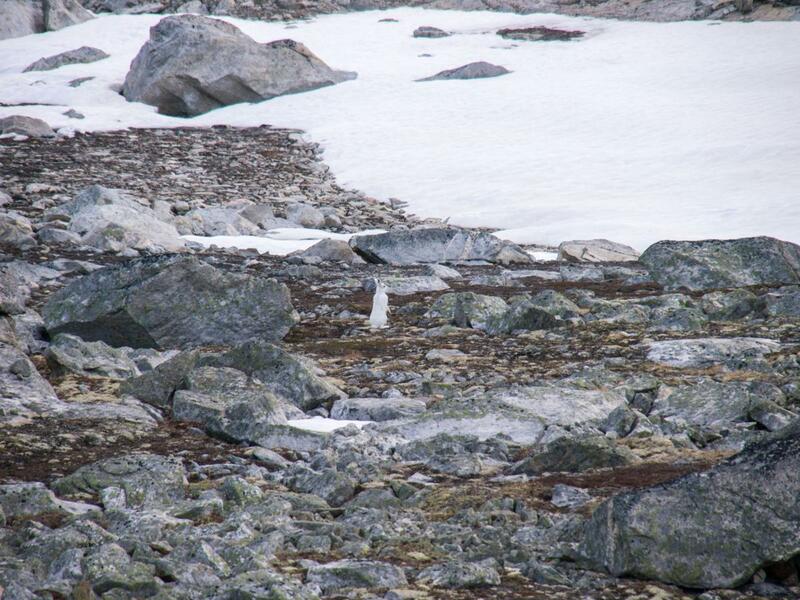 A ringed seal chases me at a distance of about 50m for some time, regularly popping up from the almost unwrinkled fjord water, then rolling over its back again for a next dive. 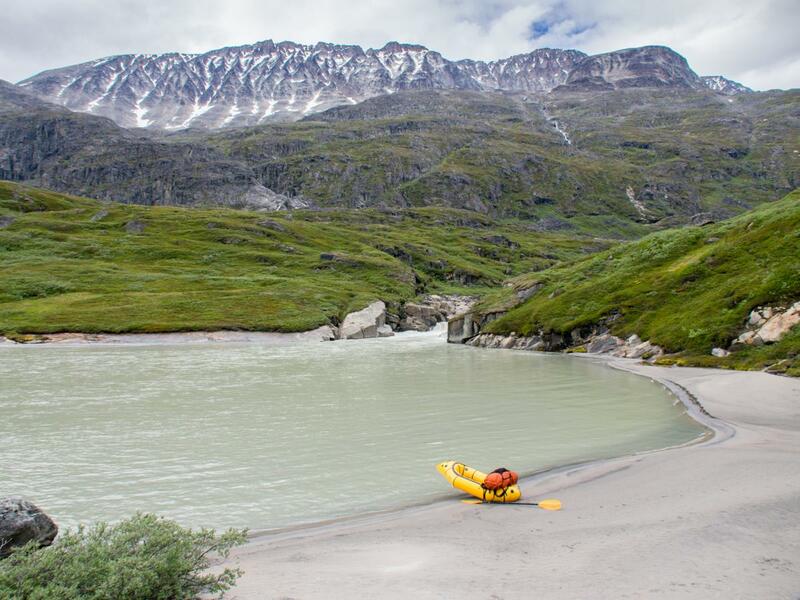 I paddle along the cliffs with thousands of birds constantly crying above me and pooping the scarce and tiny beaches, convincing me not to take any breaks until I finally round the corner and reach the delta of the Isortoq river near an old wooden barn. 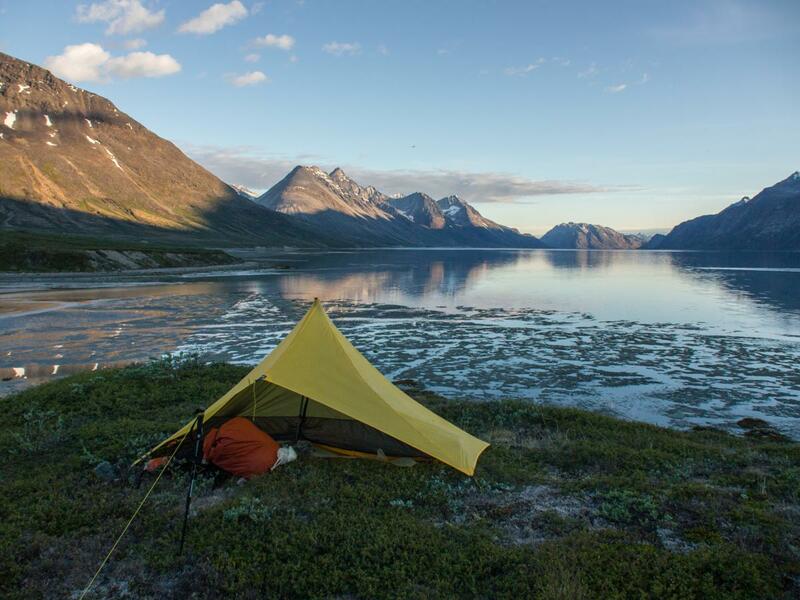 It is shortly before four o’clock in the afternoon, and after a series of long stages I decide to call it a day and make camp on a flat spot above the fjord, about 100m west of the mouth of the river. For the first time of the trip (but unfortunately not the last), the insects are out in great numbers. Hundreds of small flies and mosquitos swarm around my head, feasting on my hands and ankles as soon as I give them the chance. In the evening the weather starts to clear, and I decide to climb a 500m subsidiary peak on the south ridge of Alakarigsupqáqâ. 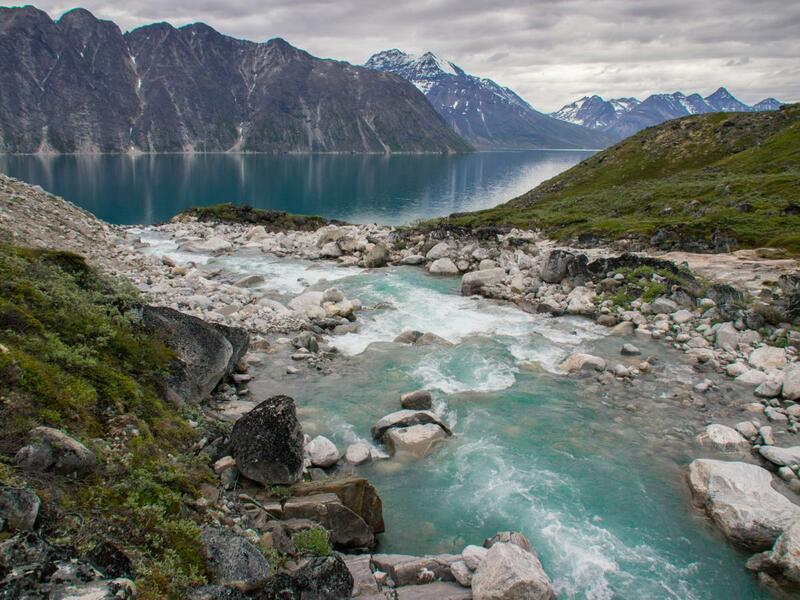 The views through the Isortoq valley, with the river dumping its grey water into the turqoise Søndre Sermilik fjord, are once again fantastic. 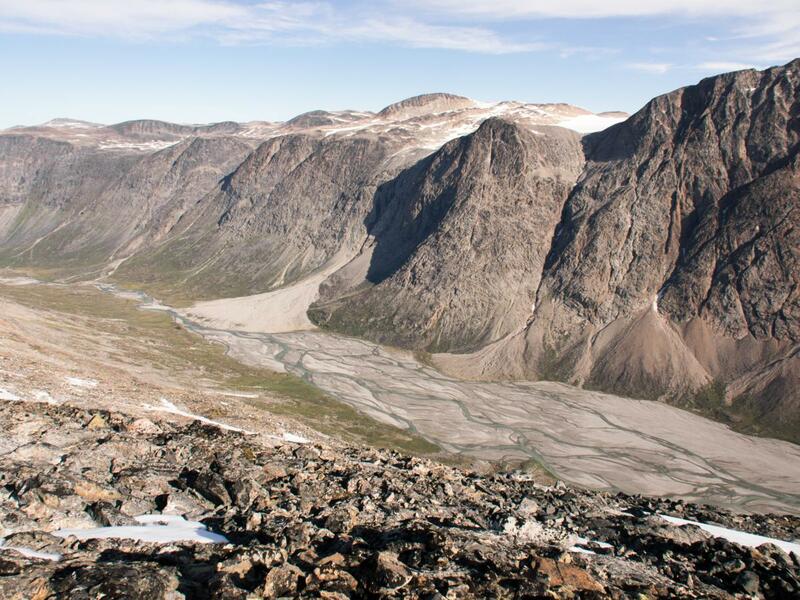 In the east I can look deep into the Itivdlerssuaq valley, my gateway towards Tasermiut fjord. It looks like I will be able to avoid most bushwhacking by walking through the riverbed. The point of the trip has come where I have become one with the wilderness, and where all daily worries have become futile. A big smile when I look on my map: 18 more days of rugged wilderness coming up, with scenery which promises to become ever more impressive.